google ads pop up” for adsense disabled? Tell me clearly chandana, what you have asked? वह क्या गुगल की पोलीसी को फोलो करता है ? Account Disable to नहीं होगा ? kayi log use karte hain jinka account disable nai huya but kayi logo ka ho bhi jata hai so why to take risk! 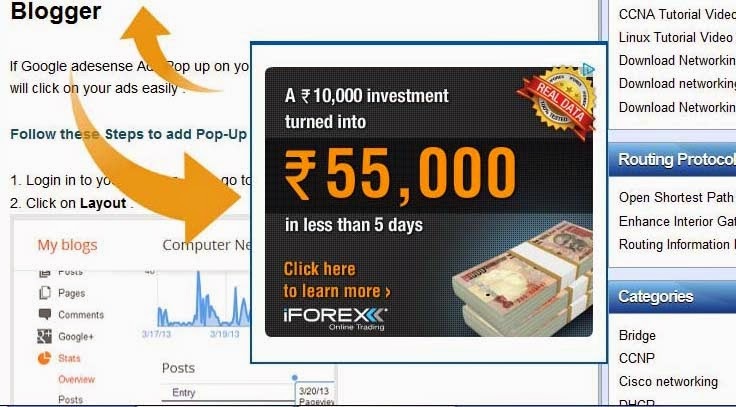 If we place pop-up ads in the center of the page then its ok or its against google Adsense policies. I wonder why adsense don’t allow that. This is certainly a cool way of making more money. Thanks for the information bro.I have been searching for this.Will the above script works on wordpress too? I can’t say that if Adsense will take action or not as it depends on your luck. I didn’t knew Adsense Banning those publishers who uses Pop Up.. I thought it would be a good idea and great way to earn more dollar from adsense.. :/ No Luck! Hy is your blog do-follow? Do yuo mind if I leave my blog link here? how to get adsense quickly. can you tell me. Hi Yogesh, be ensure to post good content regularly and i can see you are on blogspot so they takes 6 months for approving adsense ads. Dear i have one doubt can you tell me the process in which you can use the google ads with your post on the upper of the comment box means the suggestion posts with google ads please help me how can i put this type of ads on blogger or wordpress? Yes this is good information but I fear google will not oppose it? You may remove this pop-up if you get any warning from google.. But have a try!